4★ Host Yggdrasil Omega (Impossible). 5★ Host Godsworn Alexiel (Impossible). It was prophesied that the great tree shall bequeath its eternal knowledge to an adventurer long-versed in the ways of battle. Within those branches and leaves lay dormant the wisdom of eons. Nether Veil Big Earth damage to a foe. Earth damage upgraded to massive. This weapon is safe to reduce or use as fodder. 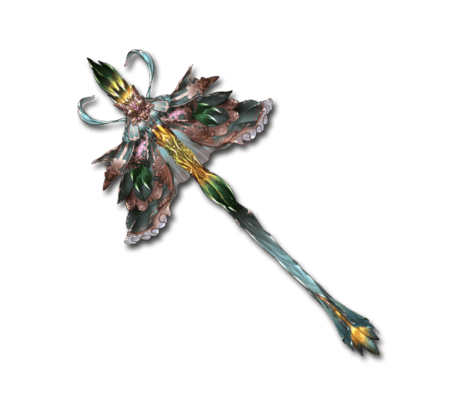 Can provide Omega ATK until replaced by Yggdrasil Crystal Blade Omega. Not a bad idea to save a few for battles requiring high HP. This page was last modified on 10 March 2019, at 10:14.